RoboCV, a resident startup of the Skolkovo Foundation that turns forklift trucks into autonomous robots, has been named one of the best AI (artificial intelligence) startups in Europe by Valuer, a company that provides matchmaking services between startups and corporations, accelerators and investors. 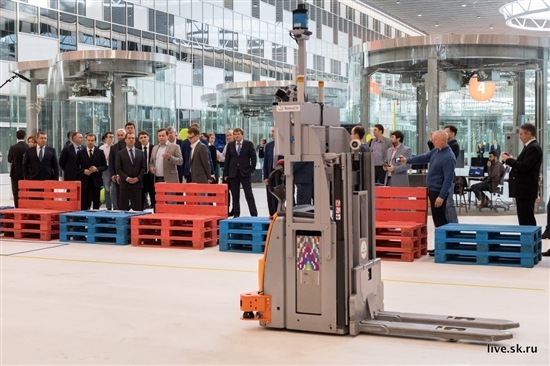 One of RoboCV's autonomous forklifts moves around the Skolkovo Technopark as Prime Minister Dmitry Medvedev looks on. Photo: Sk.ru. Valuer’s description of RoboCV reads: “RoboCV has developed a system that allows you to cost-effectively automate the shipping of goods.” The company’s X-Motion NG solution aims to automate the movement of horizontal pallets within warehouses and distribution centres by equipping regular electrical forklifts with RoboCV’s autopilot system and using a cloud-based service to optimise task distribution among the robots in real time. The system, whose cloud service allows warehouse managers to monitor the exact location of any cargo at any given time, has been tested at major global companies including Samsung and Volkswagen. “AI is completely transforming the way that we work, and the future of our industries,” reads the article listing Europe’s best AI startups published on Valuer’s website. Based in the Skolkovo Technopark, RoboCV is the only startup from Russia to make the list of 33 startups. The website identified a total of 13 AI startups working in Russia, compared to 121 in the U.K., 51 in Germany and 39 in France. “Currently, 400+ AI startups reside in continental Europe, and the number is growing,” said the article by the Copenhagen-based Valuer, which has developed a platform that uses crowdsourcing and artificial intelligence to detect, predict, evaluate and select startups that are particularly relevant to large companies. RoboCV, a resident of the Skolkovo Foundation’s space cluster, demonstrated its technology at TechCrunch Disrupt New York last year. It was also shown to Russian Prime Minister Dmitry Medvedev last year when he visited the Skolkovo Technopark.